It’s only been one week since my last update and another great event has already finished. 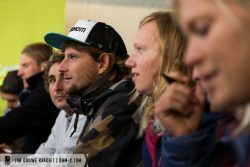 Just like last year the team of Zeil en surfcentrum Brouwersdam organized the DAMX event. An event that combines fun, promotion and lots of activities in a 5 day long action packed weekend. The event is build around the last stop of the EFPT from 2016. One more Freestyle event before the season finishes. 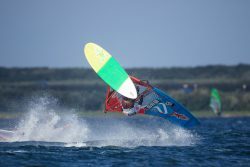 A unique opportunity to represent my sponsors at my home spot, especially Brunotti who is the main sponsor from this event. The forecast was good and even though the temperature was low everyone was fired up to get on the water! On the second day of the event we got some unique strong easterly winds that kept building throughout the day. The contest area was a bit far off shore because of the wind direction. This made choosing the right sail-size a bit more tricky. The conditions where perfect with strong winds for 4.8 and 4.4, sunshine and nice water conditions. 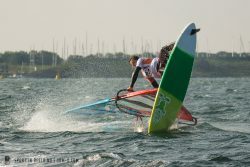 I felt good from the start and managed to sail consistent good heats. The level was incredible high and everyone was sailing amazing. I was more than happy to make the top 4 after a close heat in the quarter finals. After having a great Semi Final heat it was time for a Belgium final. Steven Van Broeckhoven was on fire in the final and I somehow lost my flow making me finish second in the single elimination. 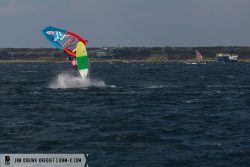 As the wind got stronger the head judge decided to go straight into a double elimination, by the time it was my heat the wind was perfect for 4.4 and the action was firing. Jacopo Testa came back from 4th place to challenge me for my second place. 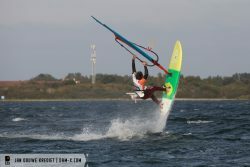 I was happy with my heat but knew I missed some good moves on one tack. Jacopo put together a almost perfect heat and deserved to go to the final against Steven. 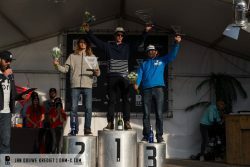 A 3rd place was the end result with consistent heats over the whole event and a nice podium finish to end this Freestyle year. After Thursday the wind dropped but the action continued with Tow-in. Because I’ve been struggling with a cold since Sylt I decided to watch the action rather than risk to get even more sick with the next contest on my doorstep, coming up in 3 days in La Torch. 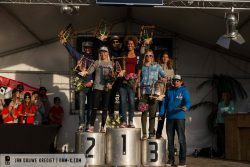 Over the weekend there was a great Fun Race organized in perfect slalom conditions. 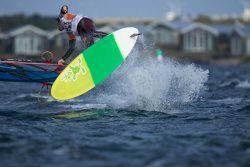 A race that attracted many windsurfers, especially young windsurfers who took part in this amazing event! Many Autograph sessions where done and before we knew it this great event came to an amazing end already!! 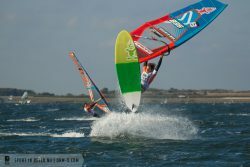 Can’t wait to go back next year and hopefully see even more windsurfers there! 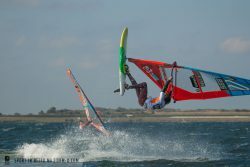 Big thanks to the organizers for this great event, it`s always amazing to sail an international event on my homespot where I spend so many hours when I was young.